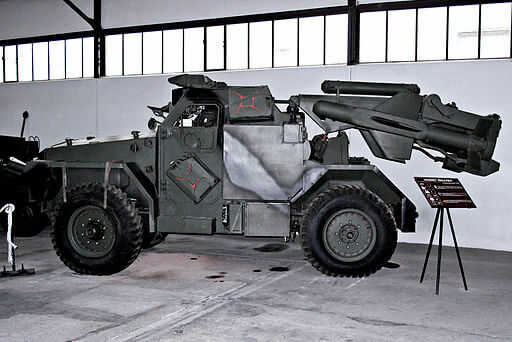 The FV1620 Humber Hornet was an early ATGM carrier, which mounted two Malkara missiles on a Humber Pig APC. The missiles were carried on a retractable boom at the rear, which was lowered for transport, and elevated for firing. A pair of reload missiles were also carried. Developed to provide airborne forces with an anti-tank capability, it could be parachuted from a Blackburn Beverley transport aircraft. The Malkara missile was controlled by the operator using a small joystick, with guidance commands transmitted down a wire. Like other first-generation missiles, it was difficult to control, resulting in a low hit probability. However, it had a very large warhead, and could destroy any vehicle in service at the time it was introduced. Unusually, it had a HESH (High Explosive Squash Head) warhead, rather than the more common HEAT (High Explosive Anti-Tank). The Hornet served with the British army from 1958 until the 1970s, when it was replaced by the Ferret Mark 5, a variant of the Ferret armoured car fitted with Swingfire anti-tank missiles.